PULSE cities: Birmingham Council is adopting open standards and practices that will facilitate data and information sharing. Air pollution is associated with a number of adverse health impacts. It is recognised as a contributing factor in the onset of heart disease and cancer. Additionally, air pollution particularly affects the most vulnerable in society: children and older people, and those with heart and lung conditions. There is also often a strong correlation with equalities issues, because areas with poor air quality are also often the less affluent areas. The annual health cost to society of the impacts of particulate matter alone in the UK is estimated to be around £16 billion . Birmingham has the highest rate of diabetes in the country, with nearly one in 10 people in some parts of the city living with the disease. There is strong evidence for the socioeconomic patterning of the major known risk factors for type 2 diabetes in the UK. Obesity, self-reported physical activity, smoking, and self-reported consumption of fresh fruit and vegetables are all lower in adults in the poorest compared to better off households. Alongside this each year in the UK around 40,000 deaths are attributable to exposure to air pollution and it plays a role in many major health challenges (asthma, diabetes, heart disease and strokes). The West Midlands conurbation suffers the most extensive exceedances of the EU annual limit for nitrogen dioxide in the UK. 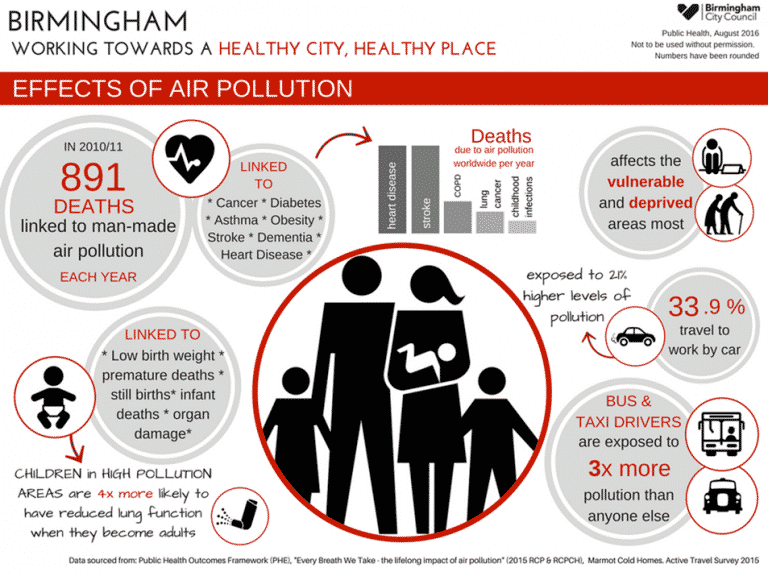 High pollution is responsible for 520 deaths a year due to respiratory and cardiovascular disease in Birmingham according to Public Health England, rising to 1,500 across the wider West Midlands. Birmingham Council is adopting open standards and practices that will facilitate data and information sharing across partners and support and advocate system wide integration and interoperability to facilitate secure and safe networks for data exchange, in line with developing our IoT capabilities and network dependencies and the development of an innovation data platform that will bring together a wealth of community data from a myriad of intelligent sensors and city assets. For PULSE, Birmingham will work collaboratively with internal stakeholders in Birmingham City Council that cover transport, public health, environmental health, health and social care and economy and wider external partners that include third sector, universities, technologists and innovators, particularly data owners relevant to health, mobility and other related areas.